Would you dare to go to a desert? If yes, then Mihirgarh is destined for you. A fantastic sandstone fort in the Thar Desert is ready to give you unforgettable impressions and emotions, which can`t be compared to any other. This hotel offers only 9 suites, but they definitely have much to show you. 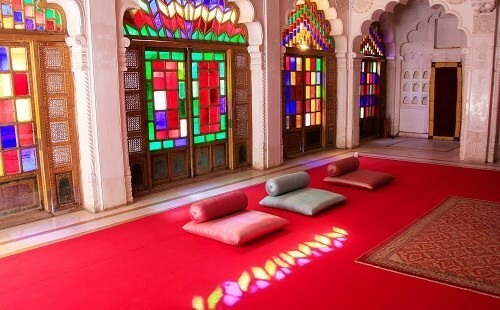 Their design reflects everything about the Rajasthan culture, exotic colors, bright and spacious rooms, elegant furnishing, and numerous antique knick-knacks. At the same time this place has all of modern conveniences such as private spa, plunge pool, Ayurvedic massage, and silk-cushioned verandah. Also, there is a long list of things to do apart from this. You may go on a jeep safari to Bishnoi, get to know the culture of local residents, but the best thing to do is to take a horse safari across the Thar. Just imagine you gallop on a regal Marwar horse across the boundless sands in the sunset!